School is back in session and many of you are packing lunches to send with your children. Or, you might be packing a lunch for your spouse or yourself to take to work. Packing your own lunch is a great way to save money, but trying to put together lunches at the last minute can be time-consuming. And that’s where freezer cooking comes in! 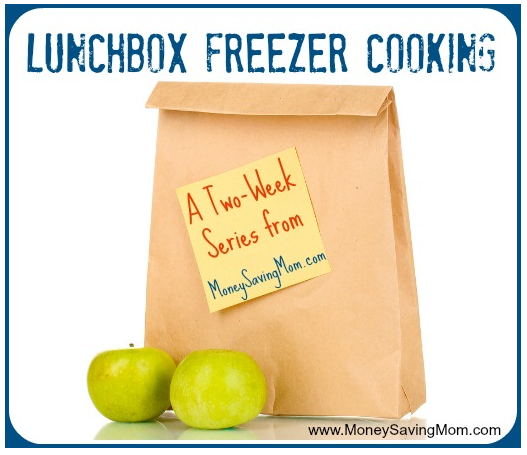 For the next two weeks, we’ll be doing a Lunchbox Freezer Cooking series here on MoneySavingMom.com. I’ll be making a different freezer-friendly Lunchbox item each day — and I’ll be blogging about it, with pictures, and encouraging you to join in and make what I make or another recipe that would work for brown-bagging it. Will you be joining us for some or all of the cooking/ What are you plannign to make? Leave a comment with your list and links to your recipes! The problem is that most of these items need to be heated up to really enjoy. While my preschooler is lucky to have a teacher with a microwave, the other gets a cold lunch everyday. This is my issue as well. My oldest just started Kindergarten and it’s 6 hours between when he gets on the bus until he eats lunch. Any cold lunch ideas would be a BIG help. I’ve tried using a thermos but it just won’t keep foods hot for that long of a period of time. We’re 4 weeks in and ham sandwiches are already getting pretty boring! There should be lots of extra ideas posted by others in the links section. So be sure to check those out! I had this problem over the summer when my DS went to day camp. We did a lot of pasta salad, cheese and crackers with sliced turkey (my version of lunchables), and leftover pizza. We also did yogurt and granola. Nothing was freezeable but easy to throw together. Ditto! Need stuff that can be enjoyed cold! My children are lucky enough to attend a small school that provides microwaves. Last year was easy as my 9th grader would take leftovers 2 or 3 days per week. This year he’s decided he doesn’t want to stand in line for the microwave and prefers cold lunches so I’ve got more of a challenge. I would like to see some “cold” lunches also. Maybe others will share ideas. Same here! Pre-school won’t heat lunches. We’ve been doing varieties of sandwiches. Ham and cheese. Turkey and cheese. PBJ….and lunchables. I need ideas for things that don’t need heating up. Yes, I had a lot of trouble finding recipes that would freeze well but didn’t need to be heated — and I also know that some adults would prefer things that can be heated, so I tried to include a variety. How about a Black Bean and Quinoa salad with maybe a couple of strips of cold grilled chicken on top? I think cold pizza tastes great if it is homemade. Super easy to make. Also a cold pasta salad with peas, basil, red bell peppers, mushrooms and asparagus is really good too. Thank you for the bean and quinoa idea. My son also needs cold lunch ideas, and right now his doctor is trying him on a gluten and grain free diet until we narrow down what he can handle and what is problematic. Since quinoa is technically a seed, for now it’s okay. We are mostly on protein and veggies right now, so this was a great idea. I am anxious to join in this freezer cooking plan. I need to think about some of the things I need to make but I like these ideas. I try to make enough lunch supplies for 5 people for 5 days so that is a lot of preparing but cost effective in the long run. I’m going to try to join in. My oldest just started kindergarten and he takes his lunch part of the time. I’m going to be looking for meals that don’t need to be heated up or a way to keep them warm for 3 hours. Does anyone know of a kid friendly thermos or container for keeping items warm? I found some really good Thermos brand thermoses in the camping section at Walmart. They’re about 6″ tall and have a spoon that folds up and fits in the lid. They are kind of pricey (around $15-16 each) but I think it’s a worthwhile investment, since our kids take their lunch to school almost every day. We’ve tried cheaper thermoses in the past and their food was always cold by lunchtime. One tip to help keep food warm: Before you put the food in, fill the thermos with boiling water, put the lid on, and let it sit for five minutes or so. Then dump the water out, put the food in and close it up right away. We use Funtainers made by Thermos. They are metal, so safe for kids of all ages to take to school. We bought ours at Target several years ago and they have held up very well. I fill them with boiling water and let them stand for at least 10 minutes while I heat up my daughters’ food. Dump out the water, fill with the food and quickly screw on the lid. Stays hot until lunch time. Just remember to heat the food to hotter than normal eating temperature as it will cool down slightly over time. If I’m giving my daughters soup, for instance, I make sure it has boiled before putting it in the Funtainer. Hope this helps! This is exactly what we do! I even send “homemade” pizza rolls, or chicken nuggets and the kids never complain that they are cold. Sometimes if they bring home leftovers they’re still warm AFTER school! Our school district is on a 3 week rotating menu…every three weeks, it’s the same food 🙁 Much heathlier and a better vairety for my kids to pack. Not to mention more frugal too! Target has the smaller Thermoses for about $13. Ditto on the boiling water first, and heating the food very hot. They are rated to keep food hot for 5 hours or cold for 7. Making a $10+ investment is kind of difficult when you’re trusting a kid to bring it back. The cost-per-use is going to be pretty high if they lose it in a month. Or lose the top of it or some key part. Trust me, I’ve been there. Some kids are more responsible this way, for sure. 1. Make sure your name is permanently on the item. Our school is great about returning things left in the cafeteria, playground, etc., to their rightful owner if they know who it belongs to. 2. Take inventory every day. It’s a lot easier to find an item if you look for it right away than if you wait a few days, or week, or longer. The more time that passes after something goes missing, the less chance you have of finding it. I’ve had, on occasion, gone to school the next day a little early to search for a missing item personally, although usually I just remind the child to check the lost and found for such-and-such. 3. Let kids suffer the consequences. My daughter when through a stage in early elementary school where she was frequently losing her jacket. Natural consequences, which work very well for some things, would dictate that if she loses her jacket she goes without, but I could exactly let her go without a jacket in the cold mornings. But I did go so far as to provide her with a serviceable but ugly (in her opinion) jacket to wear, and put my foot down. “If you lose your jacket, you will wear this one!” Worked like a charm. We’ve never had a problem losing a Thermos or other lunch container, but if we did, I would employ a similar tactic. My daughter likes taking a yummy hot lunch from home, so that is her motivation to keep track of her things. She has two Thermoses. If she loses one, she has a spare. If she loses both, she has two choices — replace it with her own money or go without. I have found that most things stay warm, if you properly prep your (quality) thermos–fill it with HOT water and let it sit (w/ the lid on) for 15 minutes before you plan to put food in. When it’s time, simple dump out the water and put in your thoroughly heated lunch! And our thermoses (What IS the plural of thermos…?) hold everything from a hotdog in a bun to burritos to spaghetti & meatballs to nacho cheese sauce for dipping! We’ve also used them for corndogs, chicken nuggets, and rolled up quesadillas! Anything that can fit inside is fair game! Can’t wait to watch the yumminess unfold! These sound like great ideas! How fun! I am currently doing a freezer cooking series in anticipation of our 2nd baby and my focus is on breakfasts, lunches, and snacks, so this is perfect. Maybe I can try a couple of the recipes you do! Looking forward to seeing the results! I am going to be joining in. My husband takes his lunch everyday to work but doesn’t have a way to heat items up. But I can see a few of the recipes should work for him too. I will need to adapt a few recipes to be dairy free fr us, but that should be easy enough. I can see our family using these ready made lunches for those days when we run long on homeschooling and need a quick to prepare lunch. I will be making individual dairy free mac and cheese for tomorrows post. Thanks for hosting this series. There’s a good chance that a friend of mine is going to be posting dairy-free adaptions on her blog. I’ll link over to her recipe adaptions if she ends up having time to do so! I posted our milk-free version of the easy burritos. My son couldn’t stop at one tonight. Count me in for making and posting more of your freezer lunches….dairy-free style. 🙂 I love your simple recipes! Since I have kids who don’t eat sandwiches I am always on the look out for things I can cook ahead and freeze for lunches, so I’ll be following along with interest. Hope you enjoy our pizza rolls as much as we do! I am going to do a couple of these with you. I’ve been wanting to try the corn dog muffins and I could always go for some of the pumpking chocolate chip muffins! My husband and I could benefit from not having leftovers or a sandwich. However, I am going to chime in with the rest of the group in that I need cold ideas for my pre-k daughter. Room temp or cold items are what we need! Oooh, can’t wait for these. We are really working on interesting lunches this year. Today I sent blueberry pancakes, sausage and cut up fruit with popcorn for a snack. Missed out on veggies today, but hit the fun and yummy mark. Yay!! Except I need cold lunch ideas for spouses too–a PB&J just won’t do! My kids both go to large public schools and both take a hot lunch almost every day because they don’t like sandwiches. I cook or heat up their lunches in the morning and place them in a thermos or wrap them in a paper towel and then in foil. Both my 16 and 6 year old say they stay warm until lunch and they eat, mac n’ cheese, rice and stir fry, potato soup, home made pizza or pockets. My daughter does like the peanut butter and jelly as sushi I even pack her chop sticks and she feels so grown up! I am interested in purchasing a bread machine after looking at some of your post. What brand of bread machine do you use? Lunch ideas: salad with seperate dressing/croutons, bagel sammies (sandwiches), hard boiled egg with your choice of sides, tuna or chicken salad (sandwich fixings or pasta), apple with peanut butter spread on the side plus raisins and milk…..any other good ideas out there? I am really looking forward to this series. My husband really hates the idea of sandwiches everyday so we end up eating lunch out much more than I would like. I will try to join in making as many of these as I think we will eat. The southwest rollups went over well the last time I made them. Thanks for all of the great ideas/recipes! I think most of these could be heated at home and put in a wide mouthed thermos. They look yummy! So excited to try these! These ideas sound great. I have also found lots of great recipes and ideas on a website called Hillbilly Housewife. We homeschool so we are home at lunch, but it’s always nice to have something planned and/or made ahead! Thanks so much for mentioning Hillbilly Housewife! Was there a specific link that you found freezable lunch recipes at on her site? I know this won’t work with most kids (maybe with a nice teacher it could), but could work for an adult who can’t warm this while at work. These might not be a full meal for everyone (I could definitely make a meal out of pasta salad, though…), but it might help a little! One thing I’ve learned from Paula Deen’s show on how to make things last at room-temp is to take a recipe you love and tweak it so you replace the mayo or dairy items and replace the meat items. She had several recipes she adjusted for taking on a picnic, and that same concept can be applied here! Granted, I don’t know how well they’d freeze, but it could be worth a shot! I’m excited about this series. I really need some ideas for the hubs to take to work, as well as quick lunches for me to heat up during our homeschool day. It looks like some of these would work for the kids to take to their enrichment classes once a week. Can’t wait to see what you end up making! We are gluten free and I just cannot seem to master GF corn dogs. I made corn dog muffins earlier this year though, and we were in love! Don’t forget to add your hot pocket recipe here. They have been a life saver when I don’t feel like making a sandwhich! Perfect timing! I’ve been wanting ideas for heartier lunches for both my husband and me. This nursing mama needs lots of calories! Hello, I love these for lunches. My only problem is that I need ideas that I can freeze and then throw in lunches in the morning and they can eat cold or at room temp. We live in AZ so everything is thawed by lunch. I have froze guacamole and peanut butter and jelly sandwiches, but one of mine won’t eat PB&J. Any ideas you have would be greatly appreciated. I’m excited to read this as I’ve been doing similar research recently. Not only do my two high schoolers take a lunch each day, but all four of my kiddos are gone at dinner time most weekdays due to activities going on so that means packing meals twice a day. While we could always eat at 8pm each night, too often starving kids who need to get to sleep soon after we get home means that we get something out. My goal is to stay ahead of it this year with packing dinner into our insulated picnic basket. I just need to have great ideas so we aren’t eating the same thing every day. I’m really looking forward to this series Crystal. Ditto others … my daughter uses a wide-mouth Thermos for hot lunches from home. There are lots of different models of Thermos brand containers, I dont know the exact one, but I got one that said “guaranteed to keep foods hot for 8 hours” and it does a good job. Fred Meyer (my local Kroger affiliate) occasionally has B1G1 or B2G1 deals on kitchen stuff, and I got two of these Thermoses for around $10 on sale. Some may argue with me about food safety, but I’ve packed a lunch for myself almost every day for 30 years, and I’ve packed a lunch for my tweenager many days (including every day until she started first grade). We have never gotten food poisoning from eating foods that have come to room temperature between morning and lunch time. If I forget my lunch in the car when it’s hot outside, then I won’t be eating that turkey sandwich, but in my office (or the kiddo’s school) at approx. 70 degree temps, food won’t spoil in a few hours. I would argue that young children, especially preschoolers, for many foods, room temp is fine. At our former preschool (love that place and those angel teachers!) they had microwaves available to heat kids’ lunches, but most of the time they’d simply serve them at room temp and the kids would happily eat their lunches without complaint. Either way I will be doing some too. Thanks for the ideas! We homeschool, and today for school (for lunch), my 12 year-old son made corn bread. It turned out great, but in the process, I realized that I need to start spending more time in the kitchen with him….he couldn’t find the salt shaker. But he did great, overall. 🙂 I just need to start including him in our kitchen adventures more instead of just my 9 yo daughter and my little guys (3 & 5). Ok, I don’t have kids, but I seriously want to make half of these for myself for a nice lunch at work. This has come right at a time I need ideas for my teenager’s lunch. He is refusing to eat in the cafe, so when he comes home, he eats every thing in sight which is not a good thing. I am trying to put in things for a morning and afternoon snack as well as a lunch item. Since I haven’t done any lunch box freezer cooking before, if its okay I’m going to use some of yours to see how they work for us. I’ve been wanting some more simple lunches so I’m excited about this series! Also have the trouble of cold lunch! Made Peanut butter and jelly muffins today, from http://www.thesneakychef.com. The kids loved them! PB&J in a little different form, and they have veggies hidden inside!! !